According to Maori mythology, heaven and earth were once joined. 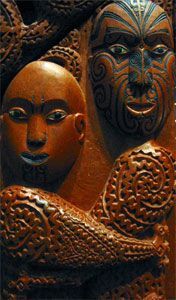 Ranginui, the Sky father, and Papatuanuku, the Earth mother, held each other in a tight embrace. They had many children who, lost in the darkness between their parents, began to wonder how it would be to live in light. They talked amongst themselves whether it would be better to slay their parents or push them apart. All the brothers agreed except Tawhirimatea, god of winds and storms. Fearing that his kingdom was about to be overthrown, he grieved at the thought that his parents were to be wrenched apart. However the others put their plan in to action. Firstly Rongomatane, god of cultivated food and crops of man, rose up and pushed at his parents to part them. Next Tangaroa, god of sea and reptiles, rose up and he too tried to push his parents apart. Haumiatiketike, god of food that grows without cultivation, was next but he had no affect either. Each brother tried in vain including Tumatauenga, god of fierce human beings. Lastly, Tane Mahuta, the god of forests, birds and insects, tried to part his parents. He paused before planting his head firmly on his mother earth, Papatuanuku. He stretched his feet upward to his sky father, Ranginui. With all the strength of his legs and back he forced, pushed and struggled to wrench them free from each other. With each tear, Rangi and Papa cried out with grief and pain, frightened by their impending separation. No sooner had heaven and earth parted, than the multitudes of human beings created within the darkness were discovered. Then Tawhirimatea, god of winds and storms who had wanted to keep his parents together, began to feel a fierce desire to wage war on his brothers; he dreads the world will become too beautiful so he ascends to his Sky father and dispatches his brothers to the four ends of creation to become the four winds. The Earth mother and Sky father remain separated to this day. Yet Ranginui and Papatuanuku’s love continues and their grief ongoing. The soft warm sighs of Papatuanuku and her loving bosom still rise up to meet Ranginui, ascending from the beautiful mountains and valleys. These sighs, men call mist. And from the vast heaven, through the long nights of separation from this beloved, Ranginui drops frequent tears upon his wife’s bosom: man calls these dew drops.